These a without a doubt the easiest waffles ever. They literally take 5 minutes to make/bake. So, break open a tube of cinnamon rolls! 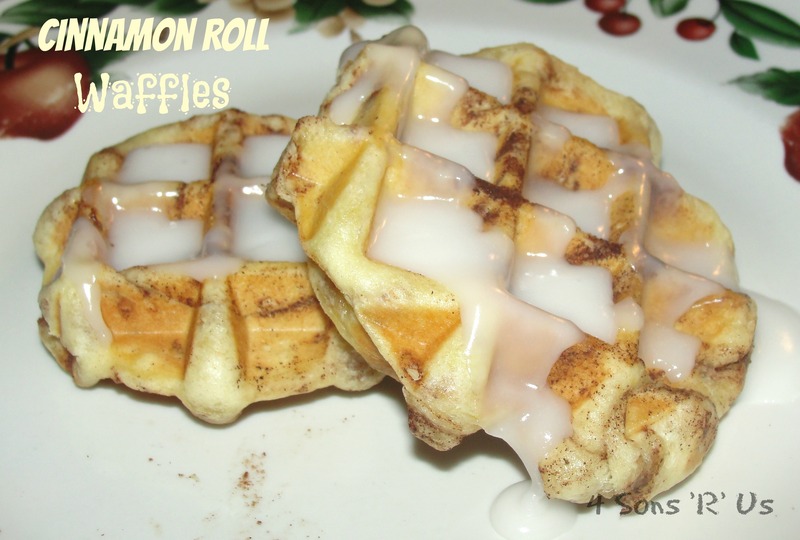 That’s all you need for an amazing cinnamon roll waffle breakfast. Well, that and a waffle maker. The sons loved these! And by loved, I mean asked for them for breakfast every morning for 7 days in a row. I loved that they’re so simple, they can make them themselves. (Of course, the younger ones would need supervision around a hot waffle iron.) Monday morning, Tuesday, Wednesday, Thursday… well, you get the idea. Mama does not cook breakfast. At least not in the morning. I value every last second of my sleep. Often I will have prepared something ahead of time that the older sons can pull out of the chest freezer and pop in the toaster oven. Sometimes not. And then your options are a) yogurt, b) a bowl of cereal or c) go hungry. So again, we all love simple, but yummy breakfast recipes! This is the sons favorite, BY FAR. 1. Heat waffle maker; spray with cooking spray. Remove cinnamon rolls from can; set icing aside. 2. For each waffle, place 1 cinnamon roll in center of waffle maker; close. Bake 3 to 4 minutes or until waffle is thoroughly cooked and golden brown. Make sure to spray the waffle iron in between each waffle since the sugars in the roll will make them more likely to stick. 3. Meanwhile, in small bowl, stir together reserved icing, powdered sugar, milk and vanilla until glaze is smooth. 4. Serve glaze over hot waffles. The sons love these with yogurt, and/or some fresh fruit. For those of you early birds who actually like to cook breakfast, or if you’re a breakfast for dinner kind of person, check out our breakfast enchiladas. They don’t disappoint. They are. Most days I’m all about simplicity, especially at breakfast time. Hope you enjoy and let me know what you think! I have heard of this but haven’t tried it myself. Thank you for reminding me because it looks delicious! I might be cracking open a can of cinnamon rolls this very weekend and trying your version 🙂 Thanks! You won’t be sorry, Andi. In the interest of full disclosure, I do have to warn you… they can be quite addicting!